Except for the privileged few, just about everyone has run into financial trouble at some point. For many, this means they are buried in debt and don’t see a feasible way to make payments every month. It is during these times that credit scores drop into dangerous levels that are difficult to pull out of. And what’s the most likely way that you found out you have bad credit? You were rejected for a new car loan, mortgage, credit card, etc. Basically at the worst time ever. So how do you fix your credit? To know how to fix your credit, take a look at the helpful advice in this article and at some of our other credit pages. The most effective ways to repair your credit will take a significant amount of time (as in at least a year) to make a difference in your score. However, that doesn’t mean you should just give up on repairing your credit. There are still some things you can do today to get yourself back on the right path. Examine your credit report. Not your score, your report. The report will contain data about your financial situation that goes into calculating the score. Check through it carefully to identify any errors that might have been introduced. Even a small error in the report could lead to a lower score that you don’t deserve. Catching errors quickly will prevent your score from dropping before you apply for additional credit. Set reminders for yourself about making payments. Simply forgetting to make a payment is a fast way to make your credit dip. In order to eliminate forgetfulness, set reminders on your phone, computer, physical calendar, or wherever else you know you will look at. If you have multiple payments that occur on different days, ask your creditors to move payment dates around so that everything is due on the same day. It is much easier to pay bills on the same day every month instead of always needing to remember what bill is due when. Reduce what debt you can. This may not always be easy or even possible to accomplish. However, lowering your debts will do more than just lower your score—it equates to less than you have to pay off in the future. In order to do this, first, stop using your credit cards. (It’s a lot easier to pay off debts when you don’t keep adding more debt.) Next, evaluate which bills you need to pay off first. Using a current income record, make a payment plan. Note areas where you can afford to pay a little extra into your debt bills than what is due. Paying just a little more every month than what is required will considerably lower the remaining balance in a shorter amount of time. Establish good payment habits. By consistently paying all bills on time, you can fix credit history steadily over time. This will take time and patience, but having a strong history of punctuality in your credit makes a huge difference. On the flip side, delinquent payments negatively affect your credit in a huge way. Work with a credit counselor. A credit counselor will give you personalized advice for increasing your score and will also establish a payment plan to get you back on track for paying bills on time. He or she may also guide you into healthier financial choices if you are tempted to deal with your debt by taking out more money. Focus on each category of the FICO scoring. This will help you better organize your credit and identify which areas need the most help and attention. For example, if you know that the short length of your credit history is the biggest thing keeping your score down, you may not need to worry as much about what type of credit you have or how much you currently owe (unless those are also trouble areas). Take care when adding on future credit. When you get your credit back to a healthy level and are ready to take on a new home loan or something similar, don’t forget that good credit habits start now. Educate yourself on the ins and outs of credit. Understand which scars are not easily erased from your record and will stay around for a long time. No matter how low your credit score is, don’t ever believe that it is beyond salvaging. There are many ways you can help yourself through healthy habits and preventative measures, but there are also professionals available that can give you the individual attention and assistance that you need. If you are unsure whether your score is high enough to afford you a proper home loan, talk to us. 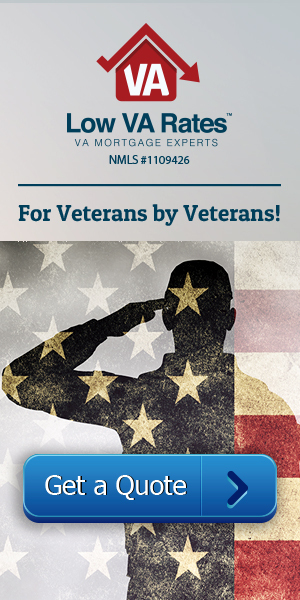 Here at Low VA Rates, we don’t have a minimum credit requirement. We work with all scores all the time and take into consideration many other factors when determining whether a borrower will be responsible in their monthly payments or not. Don’t hesitate to start saving. Give us a call now.